The Jeep Wrangler is the truck that started it all. Officially the longest running nameplate in Jeep’s history. The Wrangler was first produced back in the 1940s as a World War II vehicle, and later released as a civilian model to the American public. The official Jeep Wrangler rolled off the assembly line back in 1986, and has since been the favorite amongst off-road enthusiasts, and adventurers alike. The Jeep Wrangler has been offered in many differing types over the years, from two doors to four, with a hardtop or soft, and in varying lengths, colors, trim levels, and capabilities. Regardless of the year or specific model type, the Jeep Wrangler is one of the most iconic American cars - built right here in the United States. The 2015 Jeep Wrangler Unlimited is unlike any other Wrangler on the market. Featuring the classic Wrangler look with an extra set of doors, the Wrangler Unlimited also offers drivers impressive special-edition trims to choose from, including the off-road favorite Rubicon. Classic Jeep. Two Extra Doors. The Jeep Wrangler Unlimited has been providing drivers with a unique Jeep experience since the first model was introduced in late 2004. The Unlimited lives up to its name by offering drivers more options and features than ever before. The Jeep Wrangler Unlimited makes more space for extra cargo and passengers than any other Wrangler before it. Aside from the extra space and added set of doors for ease of access, the Wrangler Unlimited has quite a few other tricks up its sleeves that all Jeep enthusiasts will appreciate. The Unlimited Wrangler is “Trail Rated,” capable of handling any terrain you put before it. 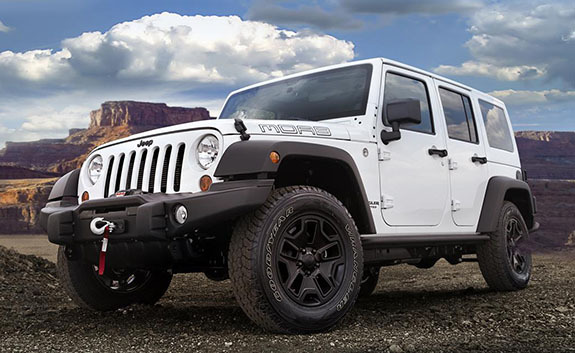 With a quadra-coil suspension, Trac-Lok limited slip rear differential, 15-inch aluminum wheels, high-pressure gas shocks, 20-degree breakover angle, and other off-road features, the Wrangler Unlimited handles like never before. The more refined, on-road quiet cabin is thanks in part to the Unlimited Wrangler’s 103-inch wheelbase. The additional carpeting in the cabin, extra dashboard padding, and sound dampening under the hood, makes for a 30% quieter ride than the Jeep Wrangler. With no direct competition, the Wrangler Unlimited exists in a rare space on the automotive market. No other vehicle can deliver you direct to nature quite like the Unlimited Wrangler, with the windshield rolled down, top off, and doors gone - you will be one with the outdoors. “Next-generation” dual front airbags, three-point seatbelts in all areas of the cabin, and front disc/rear drum brakes, are only a sampling of the advanced safety technology that the Unlimited comes with. If towing is what you need, the Unlimited is the right Jeep for you. With a towing capacity of 3,500 pounds, the Wrangler Unlimited can pull 1,500 more pounds than the standard Jeep Wrangler. The Jeep Wrangler Unlimited offers more special limited edition trims than any other Jeep. The X Edition, Freedom Edition, and Willys Wheeler Edition, are some of the special edition trims that come packed with standard features. Check out each special edition trim level below, and what they offer. Starting at $37,295, this Wrangler Unlimited model happens to be the official sponsor of the X Games Aspen 2015. The special title was not accidentally given to the X Edition, but rather earned with its extreme winter weather capabilities. Comfort - Leather trimmed seats feature a heated front seat with automatic temperature controls. The leather wrapped steering wheel will also have you driving in comfort and style. The Alpine nine-speaker sound system with Uconnect Voice Command with Bluetooth will keep your X Edition as technologically advanced as possible. Practicality - The standard all-weather slush mats will keep all of the outdoor weather off of your vehicle’s carpet. The black five-spoke wheels with Goodyear’s Wrangler SilentArmor tires will ensure that your Wrangler Unlimited X Edition will always stay on track. Exterior Style - With Rubicon rock rails, a power dome hood, and a Dana 44 rear axle all work together to offer beautiful style, and powerful capability. Capable - Command-Trac 4WD System, 3.6L Pentastar V6 engine, hill descent control, and the Trail Rated badge come together to offer the most capable on and off-road driving experience. With a starting MSRP of $32,590, the Wrangler Unlimited Freedom Edition pays tribute to America’s servicemen and women. A portion of every sale goes directly to the USO to help our nation’s heroes. Special Embroidery - The leather trimmed seats feature an exclusive embroidered star accent on the seats, leather-wrapped steering wheel, door pulls, and center console. Silver paint is also on the instrument panel, vent rings, and door grab handle. Exterior - Features body-color fender flares, mineral gray rear and front bumpers, and a black fuel filler door bring together the rugged look of the Freedom Edition. Capable - With Command-Trac 4x4 system, V6 engine, hill descent control, and trail rated capability, the Wrangler Unlimited Freedom Edition is free to perform in any terrain. The most classic of the Wrangler Unlimited models, the Willys Wheeler Edition is styled after the original Wrangler used in World War II. With a starting price of $30,695, the Unlimited Willys Wheeler is the perfect choice for classic Jeep lovers. Interior - Featuring black cloth seating, sport accents, leather wrapped steering wheel and shift knob, and off-road grab handles, this edition is as luxurious as it is capable. With Connectivity Group featuring Voice Command with Bluetooth hands-free calling, a remote USB port and an Electronic Vehicle Information Center, the Willys Wheeler has all of the technological features needed to stay connected. Exterior - With deep tint windows, Rubicon rock rails, 17-inch Rubicon wheels, four-wheel drive decal, and high gloss black accents, the Willys Wheeler is stylish and practical. Be Prepared - The Willys Wheeler comes standard with the Jeep Trail Rated kit, complete with a tow strap, D-rings, and heavy-duty gloves, all in a red Jeep bag. Each of the Wrangler Unlimited trim levels comes with unique features that set it apart from the rest. The Wrangler Unlimited Rubicon is not exception to that rule. The Rubicon comes packed with off-road features, a well-appointed cabin, and everything drivers need on and off the trail. The interior has a premium black dash, heated leather front seats, a black-wrapped steering wheel, and Quick Silver accents, bring together a luxurious cabin with that rugged Jeep feel. The 9-speaker Alpine system features an all-weather subwoofer that keeps the radio going, regardless of the weather. The steel off-road front and rear bumpers feature removable end caps and premium rock rails, sure to keep you moving in any terrain. The unique Rubicon hood features functional vents to keep the engine cool when it is working hard. With a Rock-Trac 4x4 system, a 3.6L V6 engine, and four red tow hooks, this Trail Rated Wrangler Unlimited has everything you need to go wherever the road won’t take you.